Furniture bears witness to a family’s memories. For many families, a kitchen table is a gathering place to enjoy time together after a long day. Furniture is generally a long-term investment to last your family for many years. To ensure your furniture endures for your family to make many memories in the years to come, consider adding a glass top. All Glass of Newnan offers glass coverings for various furniture to help your furniture survive the drips, nicks, and scratches of everyday life. Our locally owned company was built based upon a love for family, so we are committed to help your family keep making loving memories gathered around your furniture. A custom glass top provides peace of mind to let your family live. When your furniture has a protective covering, there is no worry if someone does not use a coaster. The glass top will protect your table from being harmed by condensation. When a spill happens, it can be wiped up easily without impacting the finish on your furniture. When your furniture is protected, your family has freedom to make messes and memories. Beyond the kitchen, glass tops can protect your living room furniture from wear and tear. When feet are propped up on the coffee table, no fear of damaging scuffs is at risk. The custom glass top allows your family to kick back and relax without damaging the finish on your coffee table. Glass top furniture has become a sleek decorative choice. Glass tops can have several different finishes, such as clear, glazed, polished, or frosted. All of the finishes can create a striking new look for your furniture. All Glass of Newnan offers free consultations to discuss what glass finish would enhance your furniture and illuminate your style. Glass tops allow heirloom or antique furniture to be enjoyed. Many families have antique furniture from a beloved family member in their home. Sadly, many stunning antique pieces gather dust in the corner because the risk for damage is too great. 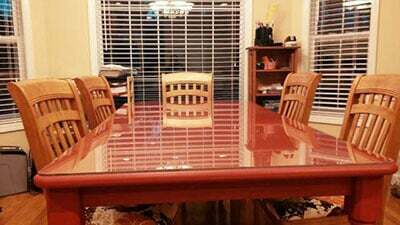 With a custom glass top, suddenly your grandmother’s beloved table can be used without fear of surface damage. Antique furniture can have old memories preserved and new memories made with a custom glass top. The team at All Glass is prepared to handle anything and everything involving glass for Newnan residences. If your furniture needs a protective coating or a style transformation, call All Glass to find the perfect glass top finish.